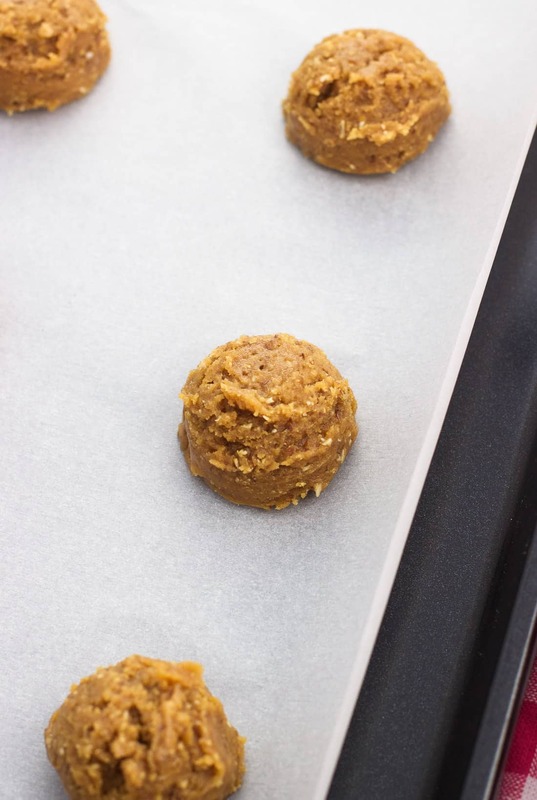 These healthy peanut butter cookies couldn’t be easier! Rich and tender, these gluten-free peanut butter cookies are made without oil or butter and with (very) minimal natural sweetener. Just one bowl and six ingredients are required! 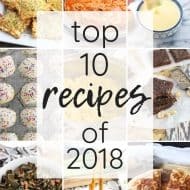 While I haven’t calculated it exactly, I’m betting that cookies are one of the most extensive categories on this blog. 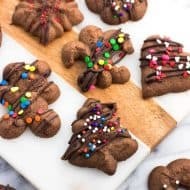 There’s a lot of variety, from rainbow cookies to pizzelles to palmiers, but there’s a common theme — these cookies qualify as desserts. But sometimes a healthier version is welcome, with ‘healthier’ meaning more than just low-calorie. Whole grains, naturally-sweetened, gluten-free, dairy-free…there’s a time and place for everything. 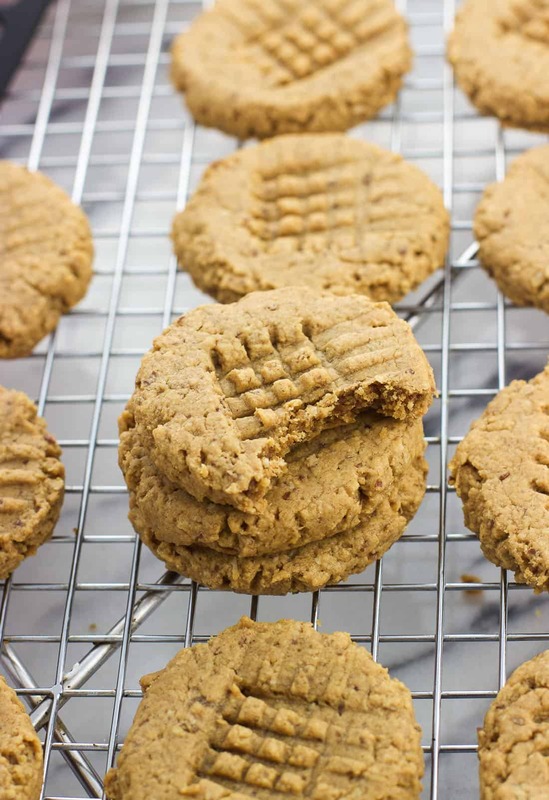 And as luck would have it, these healthy peanut butter cookies fit the bill on all four. 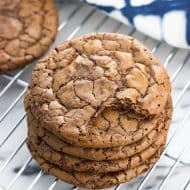 With just six ingredients, the dough for these cookies comes together in just one bowl (always a plus) and holds together very well. 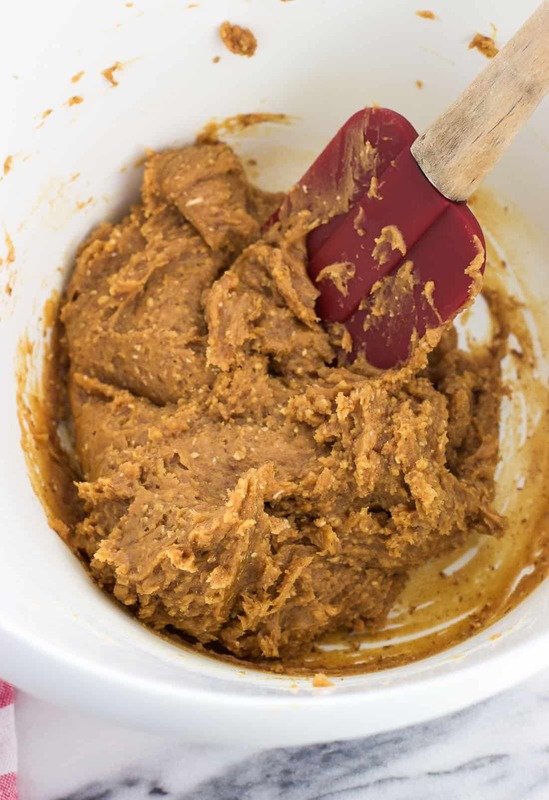 Peanut butter makes up the majority of the dough, bringing a rich flavor. For this recipe I recommend using a creamy or no-stir peanut butter. While I like natural peanut butter on/in other things, I’m afraid the separated oil, even if stirred in well, would make these cookies too greasy. And FYI, this recipe works great with other nut butters, too. Halfway through making these healthy peanut butter cookies on one occasion I realized I didn’t have enough peanut butter and subbed in about a third of a cup of almond butter for the remaining. Delicious! While we still have a bold peanut butter flavor, one major difference between these cookies and your standard variety peanut butter cookie is the sugar content. Here only two tablespoons of maple syrup are used to sweeten the batch of fifteen cookies (you can also use honey if you want). 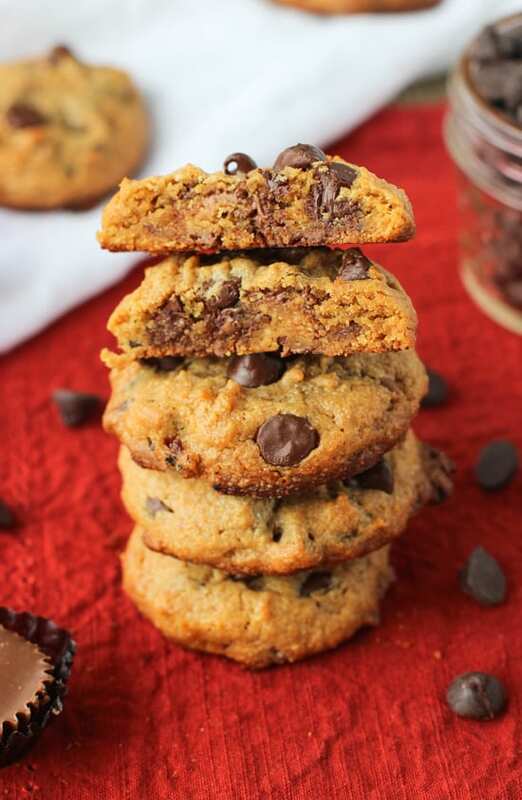 These aren’t low-calorie or likely to satisfy the most serious sweet tooth, but are a more wholesome and healthy cookie that can act like a filling snack instead of relegated to the dessert table only. To keep these healthy peanut butter cookies gluten-free, I ground old-fashioned oats and used them in place of flour. I just used my regular food processor…they won’t get as fine as the consistency of flour, but that’s okay. I also added in ground flaxseed for a little omega-3 and fiber boost. 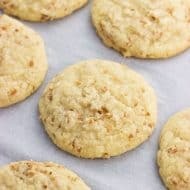 When combined with one egg and a smidge of vanilla extract, these ingredients produce a tender cookie rich in peanut butter flavor and just-so on sweetness. We can never keep these around for longer than a few days after I bake them! 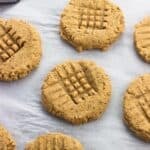 While this recipe for healthy peanut butter cookies is gluten-free, if you’re strict in that regard, be sure to use certified gluten-free oats here (but I’m sure you know that). I bought this food processor set (affiliate link) years ago and used it to grind the oats. 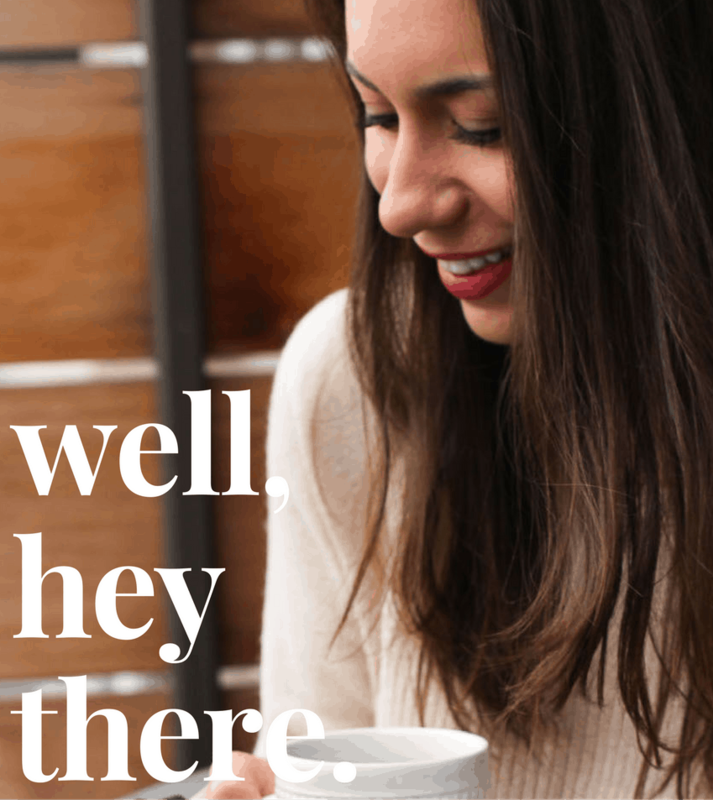 It’s super affordable and can also power through dates and nut butters wonderfully. It’s what I use for all my chia bars. 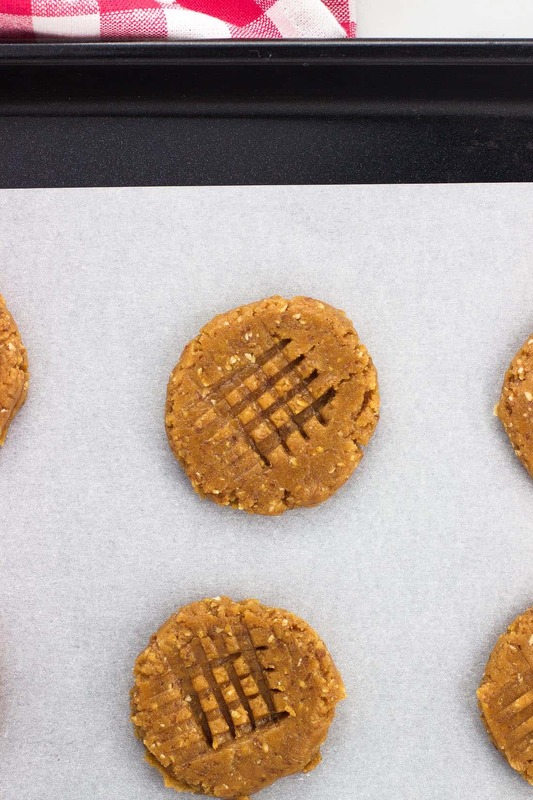 These healthy peanut butter cookies couldn't be easier! Rich and tender, these gluten-free peanut butter cookies are made without oil or butter and with (very) minimal natural sweetener. 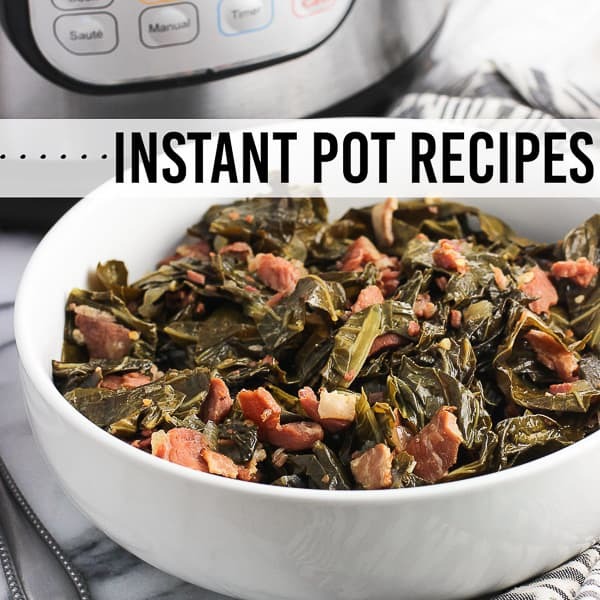 Just one bowl and six ingredients are required! Preheat oven to 350 degrees F. Add all ingredients to a bowl and mix well. Scoop dough (approx. 1 1/2 tbsp per cookie) onto a baking sheet lined with parchment paper. Flatten the tops of the cookies using a flat surface like the bottom of a glass, You shouldn't need to spray the glass with cooking spray, but do so if the flattened cookies are tough to remove from the bottom. Using the tines of a fork, lightly press a crisscross pattern into the top if you like. Bake for 8-10 minutes, or until bottoms of cookies have browned and cookies have set some. They will continue to harden as they cool. Let cookies cool for a few minutes on baking sheet, and then transfer cookies to a wire rack and let cool completely. I added about 1/4 cup of old-fashioned oats to a food processor and processed until the oats were in very small, almost powdery flakes. From there I measured out the oats (you may have a small little bit left over). *Oats are naturally gluten free, however certain brands may have cross contamination with foods containing gluten in their production facilities. If gluten is a concern, make sure to use a certified gluten free brand of oats (though I'm sure if you're in this group you know that!) 🙂 Choose your oats, vanilla extract, etc. in accordance with your preferences! P.S. If you’re looking for a more classic peanut butter cookie recipe, check out these Loaded Chocolate Chip Reese’s Peanut Butter Cookies! Photos updated in July 2018, but the recipe remains the same. 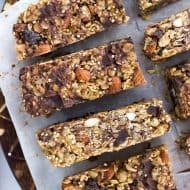 Love these healthy cookies and so does my toddler! Made our first batch today. The cookies themselves are moist and soft to the touch, but when you eat them they dry you out so bad! The taste is wonderful, but hoping someone has a suggestion how to moisten them! It is strange as the cookies don’t feel dry, but taste so dry. Any else had this issue and have a remedy? 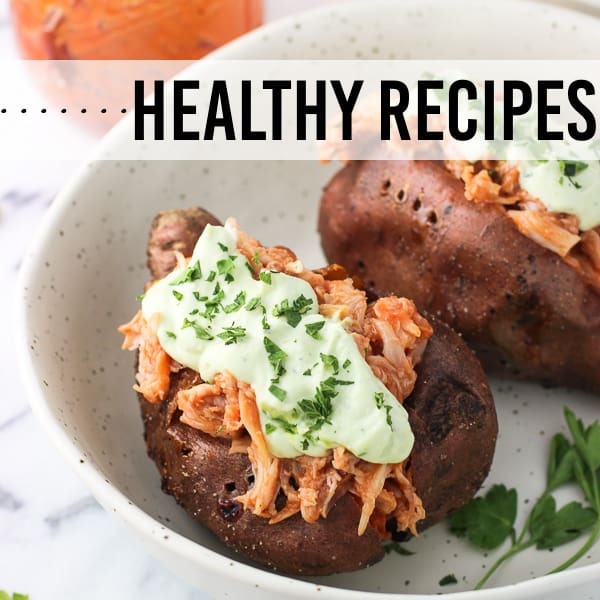 Thanks for sharing this great recipe though! If I can figure out the dry issue they will be perfect! I love the addition of maple syrup to these cookies! These are the best cookies ever! I didn’t have maple syrup so I used the same amount of honey and I used crunchy peanut butter. First bite they were not as sweet as I expected but second bite was perfect. You may want to use a little extra syrup or honey if you like a sweeter cookie. License to indulge. 🙂 Thanks girl! 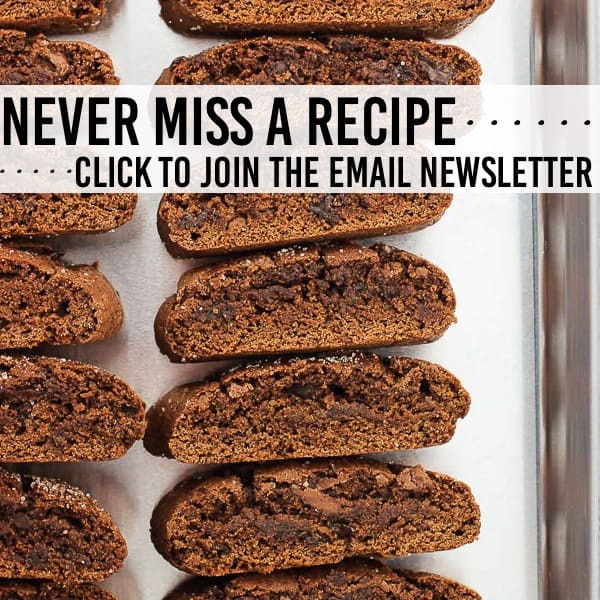 Love how simple and healthy these cookies are, totally need to try them! Peanut Butter Cookies was one of my favorite after-school snacks when I was a kid. Thanks for making it possible to eat them without guilt as an adult! These cookies look amazing, Alyssa! 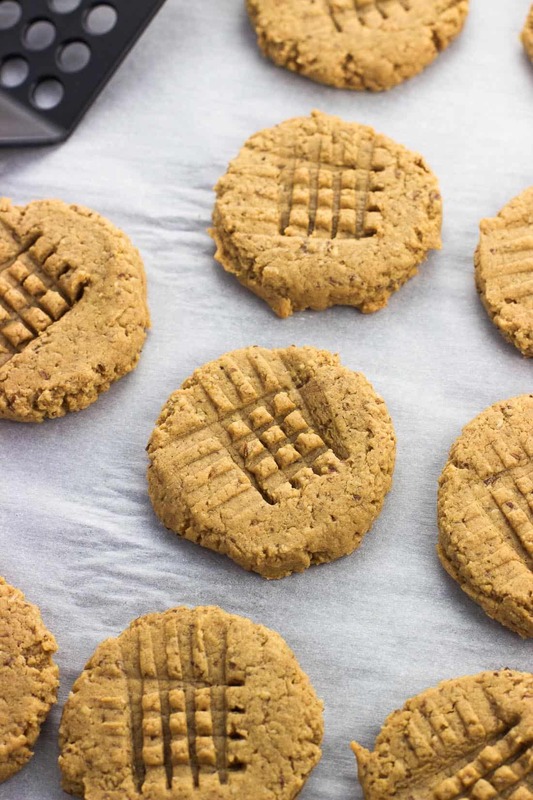 I’m in awe that they;re healthy, This might just be the best peanut butter cookie ever! Love how thick and soft they are too…yum! Yesss, relaxation definitely happened! 🙂 Thanks girl! I love how you make these cookies healthy! I would love to bring these into my boyfriends colleagues who are all training for a fitness test! Thanks Shelby! These are definitely a nice treat without sacrificing too much in the way of nutrition! Oh my gosh- these look perfect! 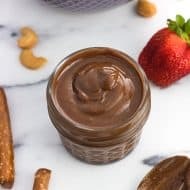 My husband is a peanut butter addict and I love all the ingredients. Oh my gosh, yes. The rain this week just drained me I think. I was so ready for the weekend! These cookies look absolutely fantastic! Thanks Ashley! Here’s hoping we get more than one day in a row of sunshine ASAP!